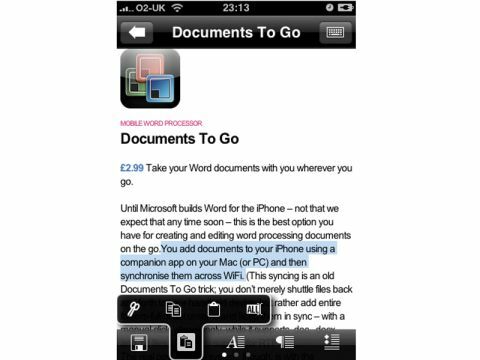 Until Microsoft builds Word for the iPhone – not that we expect that any time soon – Documents To Go is the best option you have for creating and editing word processing documents on the go. You add documents to your iPhone using a companion app on your Mac (or PC) and then synchronise them across WiFi. (This syncing is an old Documents To Go trick; you don't merely shuttle files back and forth to your handheld device, but rather add entire folders-full of documents and keep them in sync – with a manual click.) Annoyingly, while it supports DOC, DOCX and TXT files, there's no support for RTF. The iPhone's auto-correct keyboard intelligence is intact, and you can even use the keyboard in landscape mode if you want more finger space – and a tiny, singleline letterbox view of your document. Though you can't change the size of text, you can manage lists, colours and more. You can jump to the beginning, middle or end of the document, do find/ replace and – can it really be true? – word, character and paragraph counts. It's not live, but it can do selection counts too. You can view lots of other file types, but this is only a Word doc editor. There's a £6 edition that can grab attachments from Exchange servers – you can't just get them from your email in Mail – but neither can edit Excel documents never mind PowerPoint or any iWork formats.